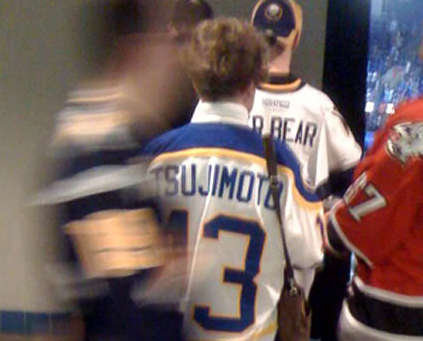 When I was growing up and attending Buffalo Sabres games in the late 1980s, I’d sometimes see fans wearing jerseys with “Tsujimoto” on the back. There were also some banners that were hung at the Aud, which always started with “Taro says…” I also seem to also remember the crowd starting a “We want Taro!” chant every now and then. I didn’t really understand any of this, but I was young and didn’t think much of it. I didn’t realize it was all part of an elaborate prank. The short version is that the Buffalo Sabres drafted Taro Tsujimoto, a right-handed shooter from the Tokyo Katanas (the fact that Katana is a loose translation of “Sabre” should have tipped everyone off from the beginning) in the 11th round of the 1974 NHL draft, 183rd overall. It was in the media guides, it was reported in the newspapers. The punch line — pun fully intended — was that the guy didn’t exist. He was made up on the spot by Sabres GM Punch Imlach (see what I did there? ), who was bored and annoyed by the slow process of drafting over the phone. 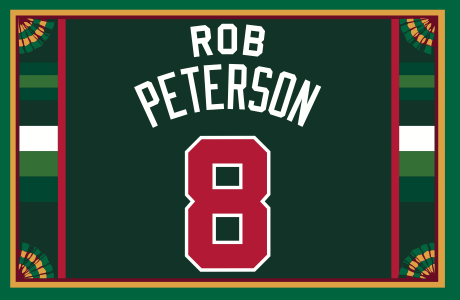 He decided to have a little fun, so with the help of PR Director Paul Wieland, the fictional player was picked in the 11th round. Nobody knew it was a joke until training camp several months later. But while the player wasn’t real, the legend of Tsujimoto has spawned a lot of very real memorabilia: trading cards, caps, bumper stickers, arena signage, jerseys, even a fictional biography. Nowadays, it’s easy enough to buy yourself a Tsujimoto jersey. But back in the day, before the advent of jersey mass-retailing, people made their own Tsujimoto jerseys, and I can remember seeing them all of the time. Decades later, the joke hasn’t lost any of its luster. I still see Tsujimoto jerseys at games — and not just in Buffalo, but even on the road at other arenas. The great thing about this prank is that the fans have bought into it and continue to promote it. That’s the kind of thing that turns a fan base into a community. Paul here. Interesting stuff — I didn’t know this story (which is why I invited Peter to write about it once he brought it to my attention). As a Mets fan, of course I’m familiar with the Sidd Finch prank. I don’t recall seeing fans wearing “Finch” jerseys at the ballpark, but maybe I just haven’t noticed..? Adam and the Babe: The Yankees are good at several things — tradition, heritage, hubris masquerading as a commitment to excellence, etc. — but they’ve never been particularly good at humor or playfulness. It’s just not what they’re about. But man, they totally nailed it with this new commercial that riffs on pitcher Adam Ottanvino’s recent claim that he could strike out Babe Ruth, complete with Ottavino wearing an old-timey No. 0 uniform (which they’re apparently going to give away!). Great concept, great execution — kudos to all involved, including Ottavino, who clearly has the ability to laugh at himself. Good for him. Longtime reader/pal Ben Traxel found that shot. Obviously, I’d prefer to have a clearer view of Taylor’s first name, but it’ll do. MLB FNOBs are so rare, we have to take what we can get! Of course, it’s also a slight jolt to the system to see an MLB player wearing No. 42, but that photo was taken in 1970, more than a quarter-century before MLB retired that number for Jackie Robinson. Yowza! I’d never heard of Wissahickon before, but it’s apparently the name of a Philadelphia neighborhood, a Philly-area creek, and a school district in the Philly suburbs, among other things. If you want to see more photos, or even purchase the jersey, here’s the Etsy listing. 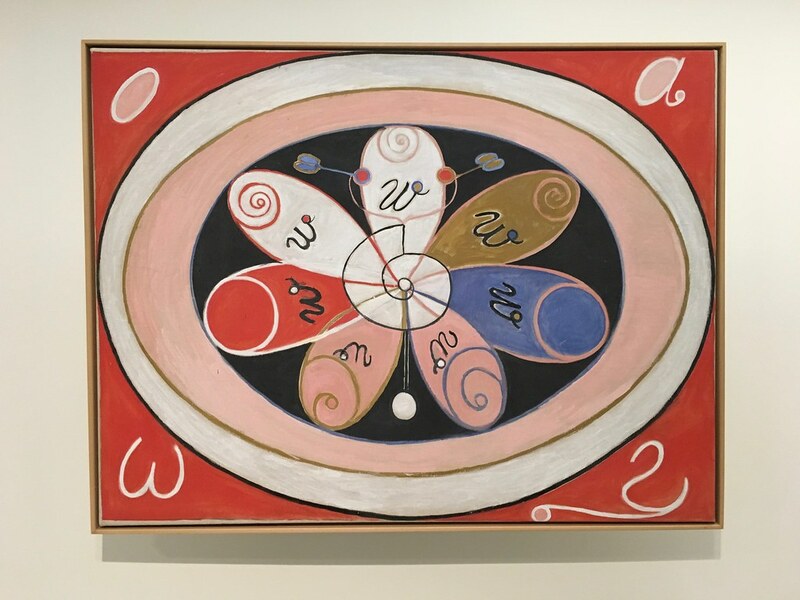 Uni Watch lurks in surprising places: On my birthday, which was last Thursday, I mentioned that I’d be checking out this museum exhibition of paintings by the great Hilma af Klint. 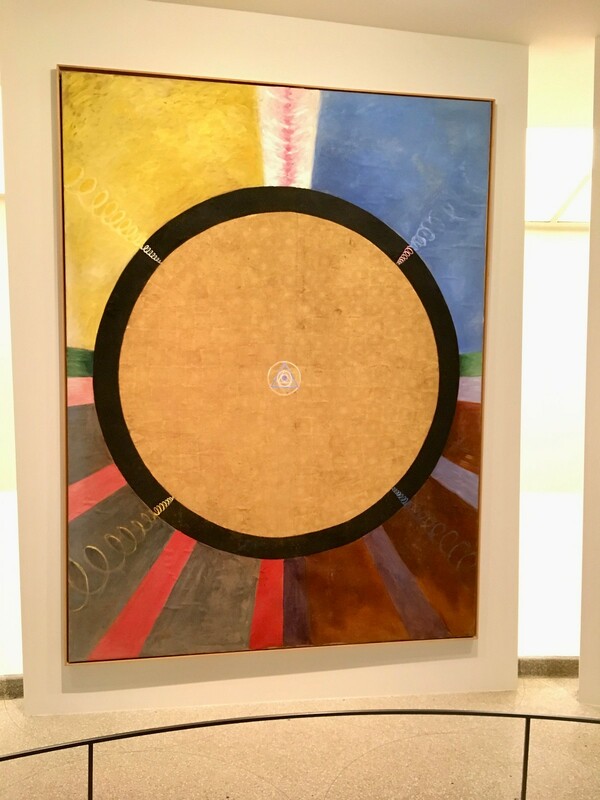 It was every bit as good as I’d hoped, but check out the painting at top-right in the photo shown above — it has “UW” (for reasons that are unclear) and is rendered in Uni Watch-ish colors! Truly a sign from above on my birthday, no? I took a few dozen more photos, which you can see here. 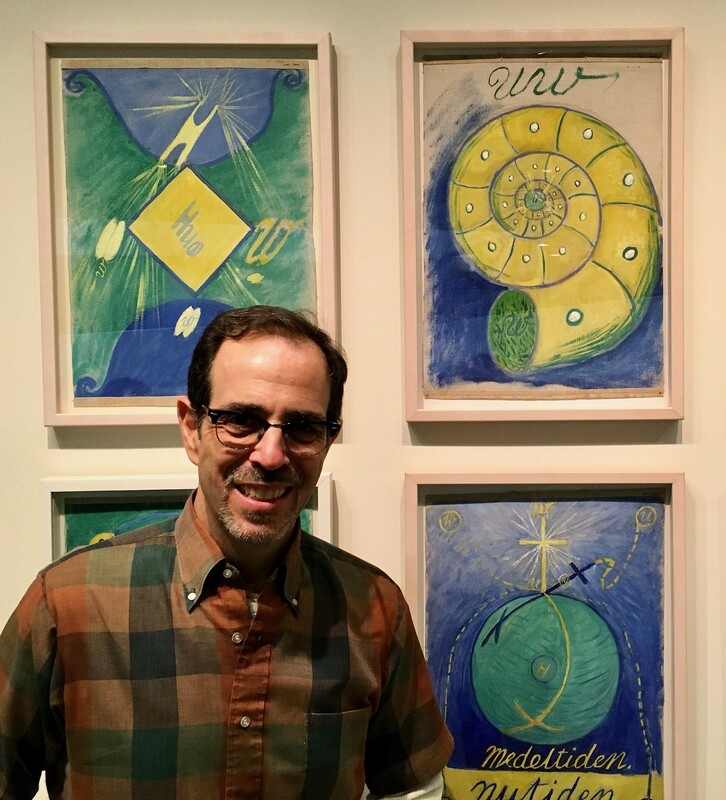 If you want to see the exhibit, which I thoroughly recommend, it’s up through April 23. 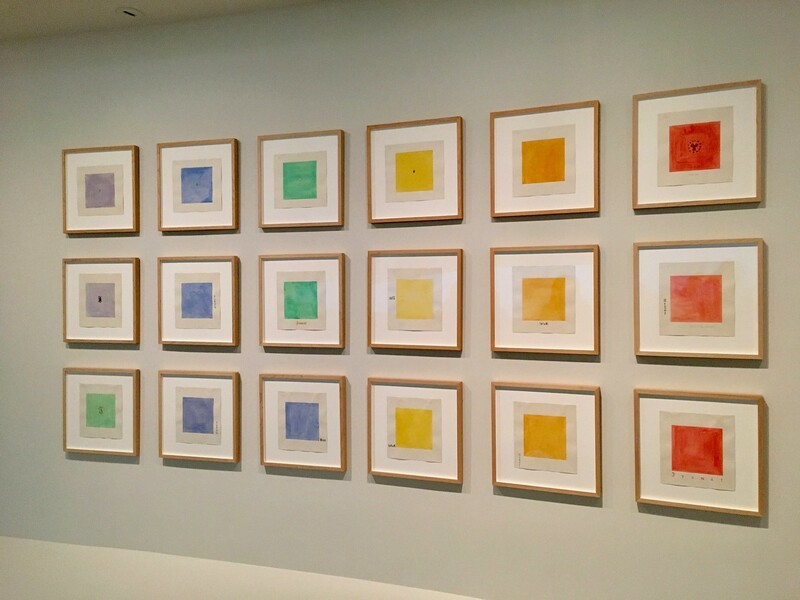 And the Guggenheim is pay-what-you-wish on Saturdays from 5-8pm. ITEM! The return of the sublimated Tequila Sunrise shirt: As some of you may remember, back in 2015 we did a sublimated tequila sunrise design (shown at right) as one of the monthly offerings in the Uni Watch T-Shirt Club. It was the first sublimated design that Teespring had ever done, and it turned out to be a steep learning curve for them. The biggest problem was that the front and back stripes often didn’t align. It was still a fun shirt, but the experiment wasn’t entirely successful. In the years since then, we’ve offered a conventional screen-printed version with truncated stripes. Does that look hot or what? The colors really pop! Unlike our original design, this one has stripes on the sleeves, and I love the two-tone collar. ITEM! Yet another new raffle: With Opening Day coming up this Thursday, our friends at Vintage Brand are offering a free item to a lucky Uni Watch reader. The winner will get to choose any single item from the Vintage Brand website (like the nifty coasters shown above, which are based on a ticket stub from the first game in Mariners history!). To enter, send an email to the raffle address by this Thursday, March 28, 7pm Eastern. One entry per person. I’ll announce the winner on Friday. 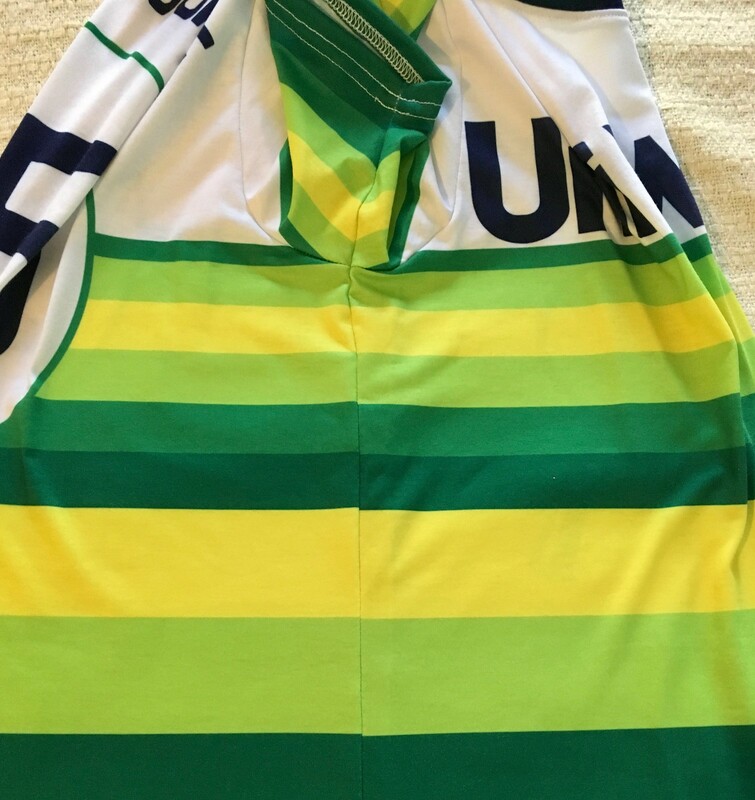 Speaking of raffle winners: The winner of the free Uni Watch membership donated by Brent Light (who himself was the winner of a free membership donated by an anonymous reader) is Randy Clement. Congrats to him, and big thanks to Brent for paying it forward. ITEM! New project: Over the years I’ve been fortunate enough to have professional gigs writing about most of the things I’m passionate about — uniforms, road trips, food, minutiae, music, and more. But there’s one topic that has eluded me: collecting. For years I’ve been pitching a column called “Collection Agency,” about collections and the collectors who collect them. I’ve shopped it to all sorts of media outlets and have always been turned down. But when I believe in something, I keep plugging away (the report card and key ring projects both took a loooong time to find their venues), and now I’m happy to report that the excellent NYC-centric news site Gothamist is giving this project a shot. 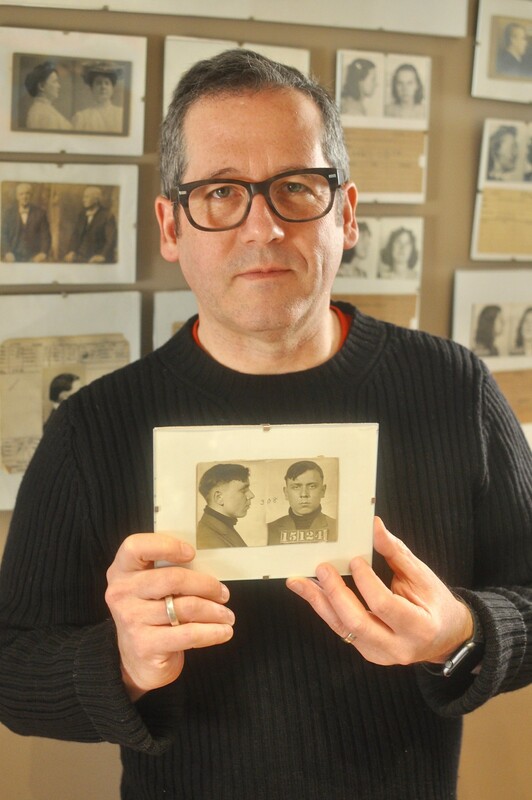 My first piece is about a guy (shown above) who collects vintage police mugshots. You can check it out here. Gothamist hasn’t yet decided whether they’ll run this as a regular column (it may depend on what kind of traffic this first piece generates), but I’m keeping my fingers crossed. Meanwhile, if you’re a NYC-based collector with an interesting collection, or if you know of such a person, I’d like to hear from you. Thanks. ITEM! 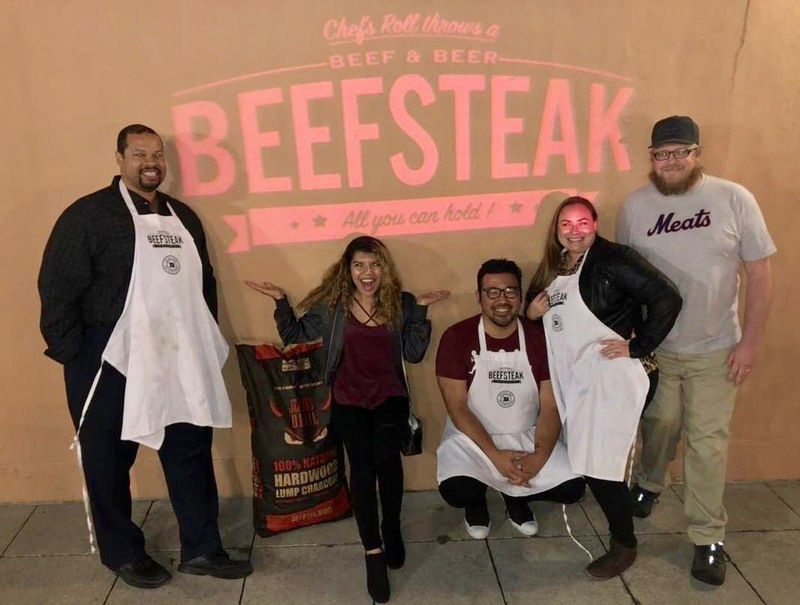 Meats shirt makes West Coast beefsteak debut: San Diego-based reader Chris Schoenthal — that’s him at far-right, posing with a bunch of his friends — got in touch a few weeks ago to let me know that he’d be attending his first-ever beefsteak (and on my birthday, no less), so we fixed him up right proper with a Meats T-shirt so he could make the scene in style. Nice job of not covering up the shirt with your apron, Chris! Chris says he got a lot of comments about the shirt. If you have any comments or questions about it yourself, you know what to do. ITEM! 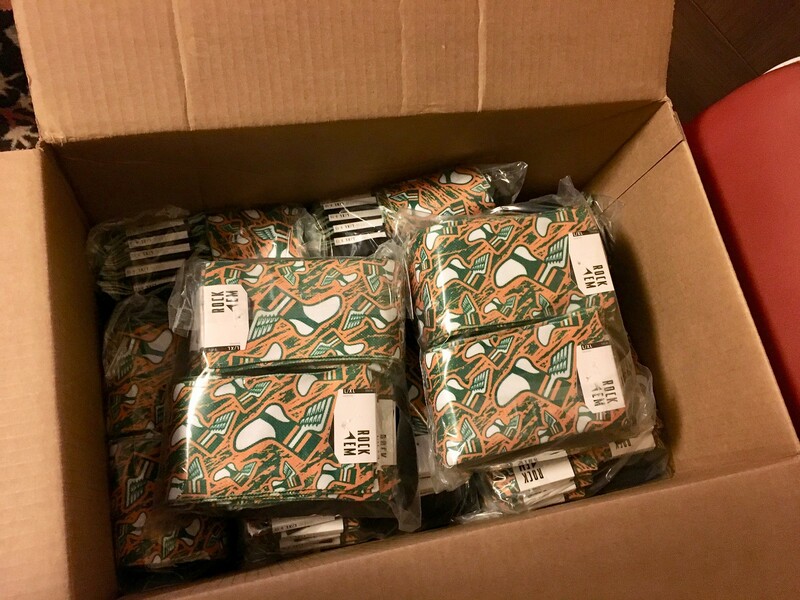 Socks going fast: Remember a few days ago when I got that big carton filled with 100 pairs of Uni Watch socks? As of this morning, 76 pairs have already sold. So if you want a pair for yourself, move fast! Full details on how to order can be found here. Thanks. Requiem for a writer’s writer: Woke up to sad news today, as word came down that longtime Mets beat writer Marty Noble had passed away. Appropriately, he died while attending a ballgame. He was 70 years old. Mets uni-number blogger and longtime Uni Watch pal Jon Springer did a great two-part interview with Noble back in 2008. It’s a great read for anyone interested in baseball journalism, or baseball in general (trust me, you don’t need to be a Mets fan to enjoy it). Here’s Part One and Part Two. R.I.P. 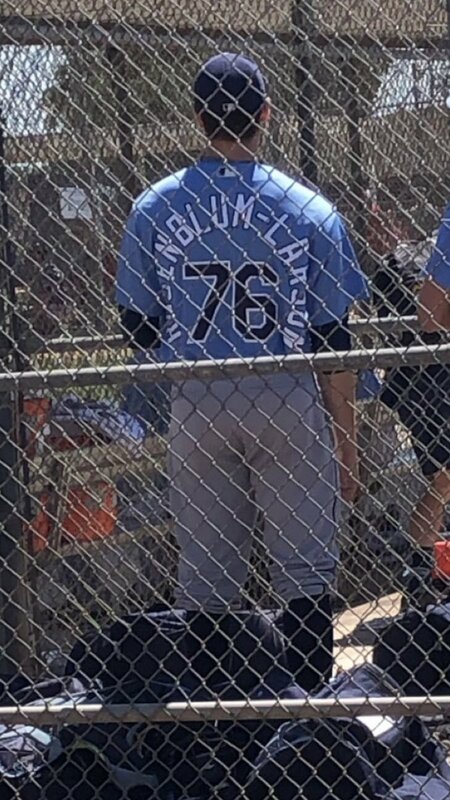 Baseball News: Yesterday, the Yankees wore their home spring training jerseys with road grey pants (from Jon Rose). … The Double-A Jacksonville Jumbo Shrimp are doing Florida Man Night this summer. Florida Man is a tongue-in-cheek superhero referring to the relatively large number of news articles about Floridians doing bizarre things (from Andrew Cosentino). Football News: Reader Bill Kellick tells us that 49ers RB Vic Washington appeared to be wearing basketball knee pads in the 1972 NFC championship game. … Also posted in basketball: Florida State added a memorial patch for forward Phil Cofer’s father, former Lions linebacker Mike Cofer, who passed away on Thursday (from @VictoryCB). … Reader Chris Quinlan DIY-ed an Oilers jacket. … UNC’s stadium is switching to artificial turf. “Not a fan of this,” says James Gilbert. Hockey News: The Capitals wore white at home yesterday against the Flyers (from multiple readers). … The AHL’s Cleveland Monsters dressed up as astronauts for the upcoming 50th anniversary of the landing of Apollo 11, a look which included white pants (also from multiple readers). … The Division III championship between Wisconsin-Stevens Point and Norwich (Vt.) — which is a military college — was yellow-vs.-camouflage (from @hockeyinthecac). … The WCHA championship between Minnesota State and Bowling Green was also color-vs.-color. Basketball News: Kings C Willie Cauley-Stein has new Kentucky-themed shoes for March Madness (from Josh Hinton). … The Bucks retired No. 8 for SF Marques Johnson (from Mike Chamernik). 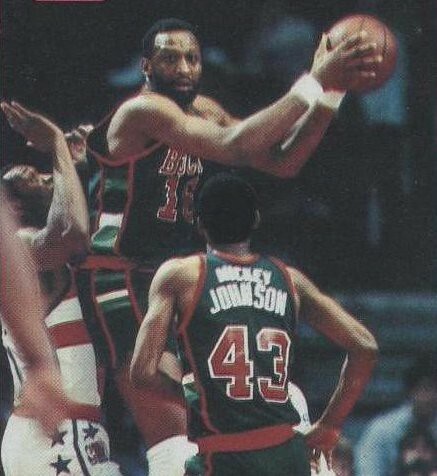 … The Bucks also gave Johnson a framed jersey with a double-decker FNOB. 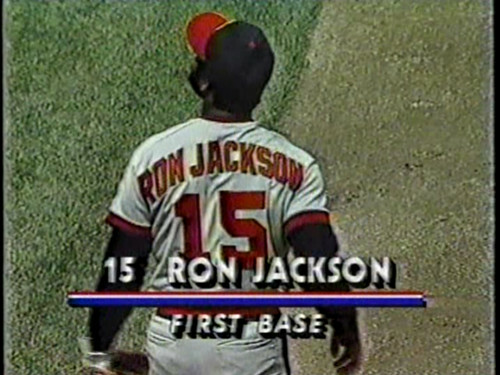 Johnson wore that style in the early 1980s, as did teammate Mickey Johnson. 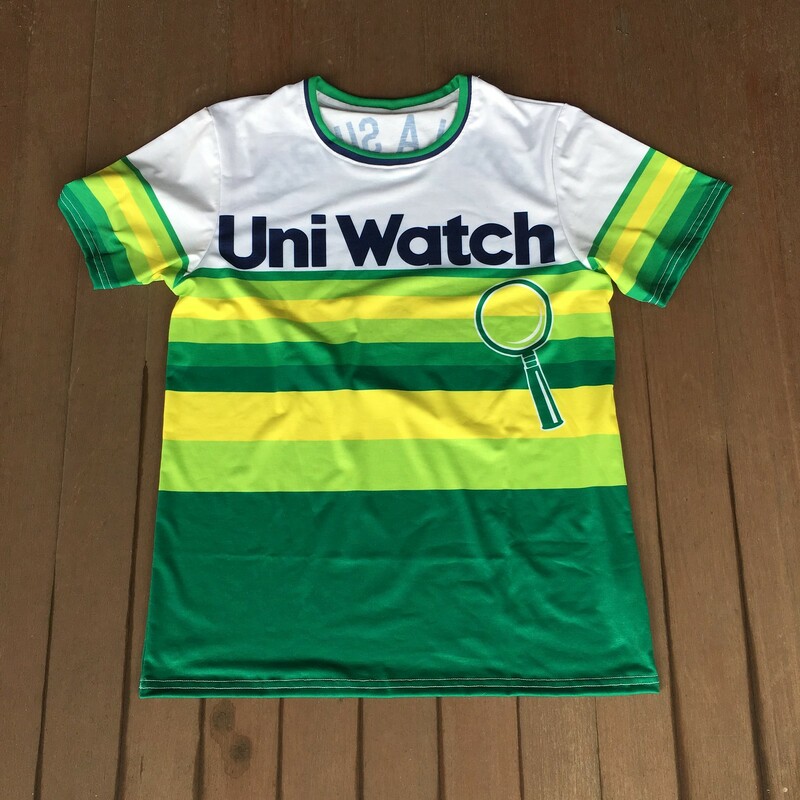 There’s even a Uni Watch membership card based on that style. … Villanova wore blue throwbacks Saturday, and borrowed the term “Uni Watch” for that tweet (from Blake Fox). … Florida State added a memorial patch for F Phil Cofer’s father, former Detroit Lions linebacker Mike Cofer, who passed away on Thursday (from @VictoryCB). Soccer News: Côte d’Ivoire and Rwanda played an orange-vs.-yellow matchup in Africa Cup of Nations qualifying (from multiple readers). … France revealed a 100th anniversary shirt to be worn today against Iceland. …. Several other national teams released one or more new kits or shirts, including Argentina, Colombia, Curaçao, Guatemala, Paraguay, and Tunisia. … The Euro 2020 qualifiers began this week and we can see that the sleeve patch (at left) is just the tournament logo without text, but the generic “European Qualifiers” patch (at right) was also kept from previous campaigns, meaning there are effectively two patches for the same competition. … England wore black armbands for Christchurch, all on the left arm except for captain Harry Kane, who wore his on the right arm. Grab Bag: A Guatemalan woman ran in the Los Angeles Marathon wearing a traditional Mayan outfit (thanks, Paul). … Australian Football League teams North Melbourne and Fremantle both wore two black armbands: one for Christchurch and one in memory of someone different for each team. … A new exhibit at the Ohio History Center in Columbus explores the state’s sports history, including a lot of uniforms (from Jason Hillyer). Tomorrow: the 21st annual Uni Watch MLB Season Preview. That’s where I knew it from. 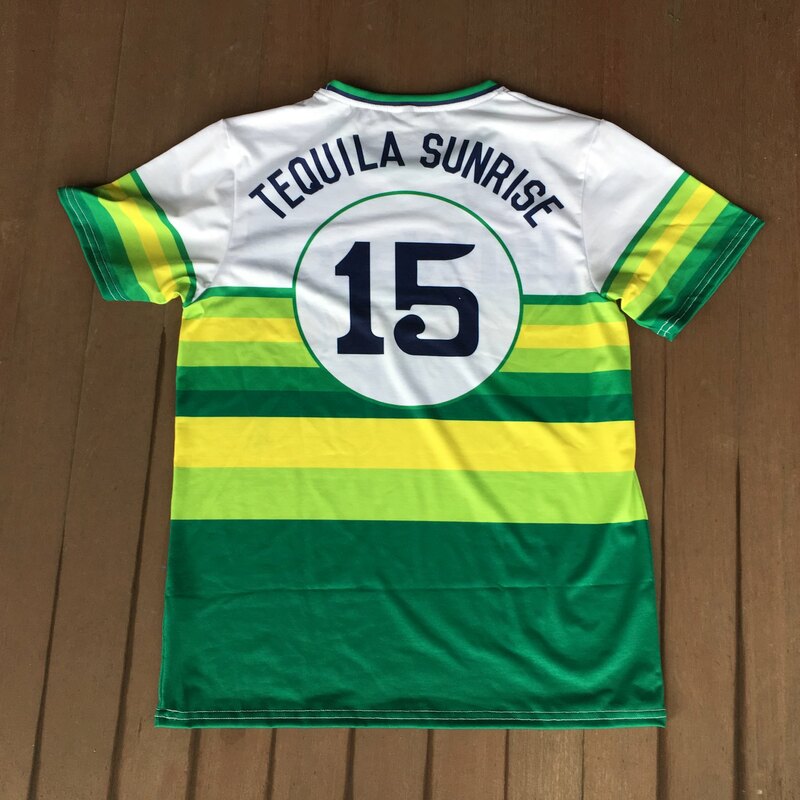 The new Tequila sunrise shirts looks awesome. already ordered one. The Taro story, never heard of it before but the idea and execution are pretty cool and funny. How can we be sure that Peter Romano isn’t a pseudonym that Paul used to write the piece on Taro Tsujimoto? Yeah, I was thinking the same thing, haha! I have one coming. Believe you, me I will be wearing that all over. Even to work on Fridays :) I have no fashion shame. I love it so much! But I really have a lot of shame :P And I don’t know if it’s worth $35 for something I really won’t have the opportunity to wear. Drafts can create some interesting stories. In this case, a player was drafted that did not exist. There have been other times when players have been drafted that will not ever play for the team. Two years in a row, 1995 and 1996, CFL teams unfortunately drafted players that had died a few months before they were selected. Ottawa Rough Riders in 1995 picking a player in the Las Vegas Posse dispersal draft that had died in a car accident in late 1994. 1996 Montreal Alouettes selected a player in the Canadian college draft that had passed away due to cancer a few months earlier. Let’s not forget the year that the Chicago Bulls drafted two gold medalists from the 1984 Summer Games in Los Angeles. The men were Michael Jordan and Carl Lewis. Lewis was also drafted by the Dallas Cowboys in ’84 as a WR. A long time ago, the original Cleveland Browns drafted Syracuse’s Ernie Davis, who died from leukemia before spring practice even started. I quit following basketball back in the 90s. last night i happened to be somewhere that a game was on. I have no idea if they’re any good, but Virginia sure has snappy uniforms. This is a very informative Twitter thread about why so many of these stories proliferate. Eleven years before baseball had fictitious fireballer Sidd Finch, hockey gave birth to the legend of Taro Tsujimoto. What hockey has never had until now – 36 years after the mysterious prospect was curiously drafted by the Buffalo Sabres – is a Tsujimoto trading card. That changed in a big, collectible way this week when Panini America released its 2010-11 Score Rookies & Traded box set…. How have I been a big hockey fan all these years and never heard of Tsujimoto?!?!?! Bill Cosby was a member of, or played sports (baseball I think) against the Wissahickan Boy’s Club as a kid. It’s part of a bit on one of his old comedy albums. Can’t recall the exact details at this time. The black armbands worn by England were also to honour Gordon Banks who passed away last month. Banks was England’s greatest ever keeper (and one of the world’s best) and played on England’s 1966 World Cup winning team. Those Rwanda jerseys have Country on Back. Not sure I’ve ever seen that before. Blue Jays’ Canada Day uniforms usually have a ‘CANADA’ NOB. Same with Team Canada in 1972 Summit Series. Why did it take so long to retire Marques Johnson’s number? Truly one of the great SFs, only to be overshadowed by Dr. J (who he played well against), and the Boston Celtics in the East. Collection Agency would be absolutely brilliant!!! Very odd that the schedule maker had the Bucs in their ’70-’75 uni instead of the pillbox and mix&match unis. Also weird to see Stroh’s instead of Iron City or Duquesne as the advertiser. Still, my wall would wear that poster. So many great items in today’s post! -I thought I knew everything but I have never heard the Sabres story. -The Oilers jacket is fantastic. 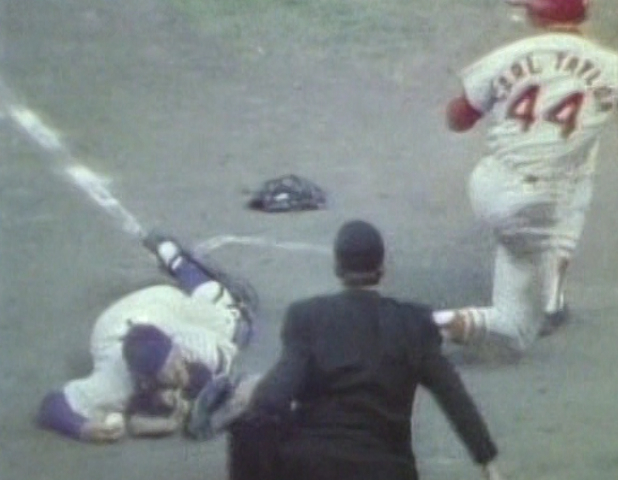 -The Ottavino video is classic. Same here John (re:Tsujimoto)… maybe a Mandela effect? Obviously (as evidenced by my user name, which I use at several different sites), I’ve been a fan of the Taro Tsujimoto story for years. Probably my favorite part of the prank was that the draft was being conducted over the phone, so before each team registered their pick, NHL President Clarence Campbell had to call the next team on the board and read off the name of each player selected in the previous round of picks. So after the Sabres picked Tsujimoto, Campbell then had to call every other team and read and spell out his name to a bunch of confused hockey execs. Interesting that Tsujimoto was supposed to be a righty, but the guy on the Score card is a lefty. Another interesting Punch Imlach story (which I am currently trying to verify online somewhere) was recounted in the book “The Ice Men” by Gary Ronberg. According to Punch, the Sabres’ original unis were modeled after the Toronto Maple Leafs but with gold instead of white “because we’ve got more class than Toronto” (his quote to the best of my recollection). Yeah Wissahickon!!! I’m an avid follower of your blog and as a resident of the Wissahickon neighborhood, I was shocked to see that jersey on your page. Keep up the fantastic work! I really hope you’re able to find a home for Collection Agency, because that article is fascinating! If only there were a Journal of Conspicuous Consumption that could provide a home for Collection Agency. Sigh. I too hope the project finds a worthy home! Has a more perfect pairing of title and mission ever existed for a writerly enterprise than “Collection Agency”? 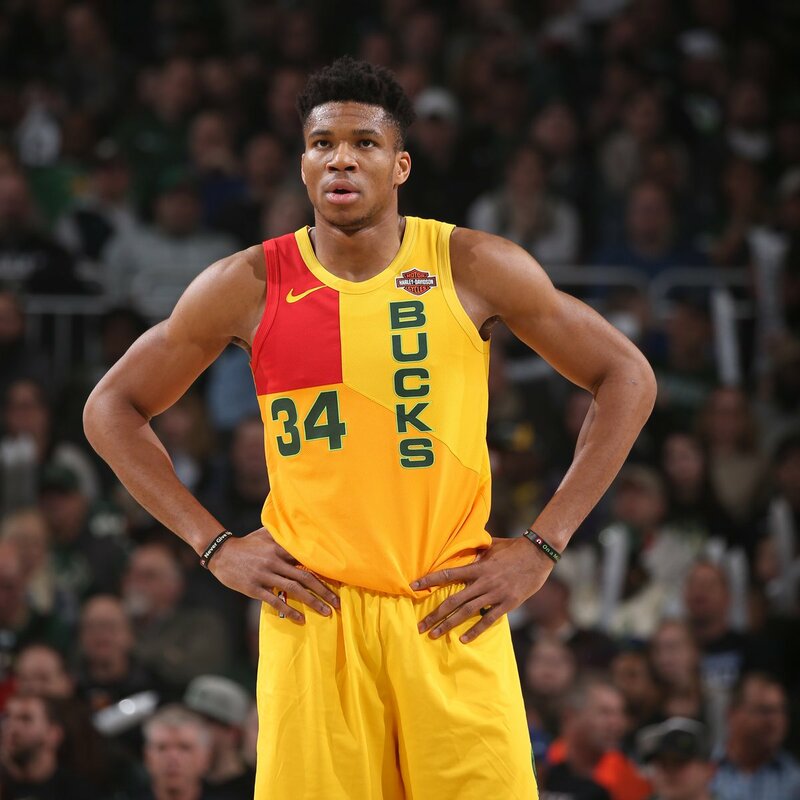 So the Bucks wore their MECCA-inspired uniforms last night at the same game where they retired Marques Johnson’s uniform. I really can’t decide if that’s fitting or a travesty. I saw the revamped Tequila Sunrise shirt on twitter the other day and HAD to order on on the spot. The original tshirt looked fine, but this shirt looks amazing. I can’t wait to get it. The sleeves and collar sold it for me. I’ll be sure to tweet a picture of me when I get it! Perhaps a bigger story than the Capitals wearing white at home is that GARBAGE the Flyers were wearing. I’ve always assumed FNOBs were less common in baseball because it’s easier to tell players apart, given the pace and physical space between them. You know which “Smith” is batting and which “Smith” is on first — harder to do that if there are two “Smiths” on an offensive line. I thought that’s what numbers are for. I thought there was a Cardinal in the 80s that had a FNOB, but it was tiered a la the Youngbloods in the NFL. I’ll search my archives. As a UNC grad/fan, I am not crazy (for aesthetic reasons mostly) about Kenan Stadium switching from grass to turf, either. But now that UNC is practicing in a brand new indoor facility, it does make sense that Mack Brown (whom I imagine is the one who made the call here) would want his guys to play on the same surface that they practice on. The main drawback to the turf is that supposedly it retains heat a lot more than grass and the early season day games in North Carolina can be hot as hell anyway. I do think that in the long run, almost all if not all major college and pro stadiums will switch to artificial turf. I hope you’re wrong on that prediction. I hold out hope that stadiums go back to grass once technology allows for growth in cold or wet conditions.